Google has announced today that it's rolling out changes to Search which will make it easier for users to find and buy tickets to a movie they want to see. Now, when searching for a good movie to go watch with some friends, users will be able to quickly filter and compare a whole bunch of factors, including ratings, showtimes, theater locations, and more. 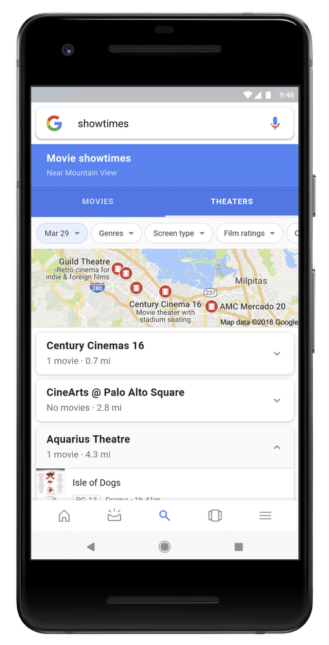 In addition to being able to find nearby theaters based on where a where a specific movie is playing, users can also pick a favorite place and search only for movies that are showing at that particular theater. To try out the new experience, users can search Google for "showtimes," "movies," or for movie screenings around a specific place. Currently, the feature is available in the United States and in India (in both Hindi and English), and works on Google Search in mobile browsers and on the Google Android app, with iOS support coming soon.